oil on paper, 4 1/8" x 6"
oil on paper, 12" x 9"
oil on paper, 11 7/8" x 21"
oil on paper, 8" x 21"
oil on paper, 7.5" x 6.5"
oil on paper, 6.25" x 5"
oil on paper, 8 5/8" x 6 3/8"
oil on paper, 12 3/8" x 11 1/8"
oil on paper, 8 7/8" x 6 1/2"
Stanley Bielen was born in the Podkarpackie region of Poland. He studied at the Pennsylvania Academy of Fine Art and is influenced by the long regional realist tradition called the Philadelphia School. He exhibits nationally and is represented in public and private collections including the Hirschhorn Museum and Sculpture Garden and the Pennsylvania Academy of Fine Art. Stanley lives and works in Philadelphia, Pennsylvania and Bridgton, Maine. 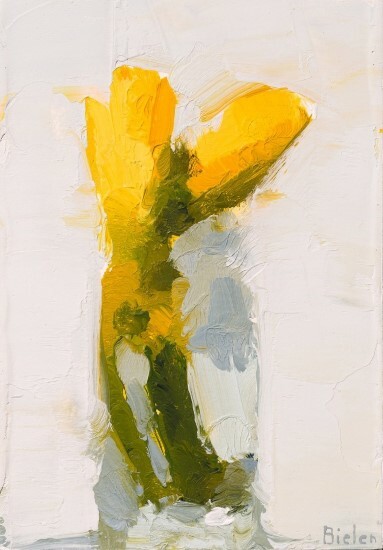 Stanley Bielen honors the European heritage of still life painting, placing high color, lush blossoms against velvety backgrounds. These small, intimate oils capture floral elegance with sweeping brushwork. Each mark is recorded in thick, intentional paint. In order to portray a feeling of momentary yet rich beauty, Stanley takes great care selecting and arranging these small format compositions with blossoms he himself grows. His intuitive attention to color and his ability to capture fleeting light harkens back to the work of Edouard Manet and Pierre Renoir. Like these Impressionists, Staley is not interested in achieving photographic accuracy. 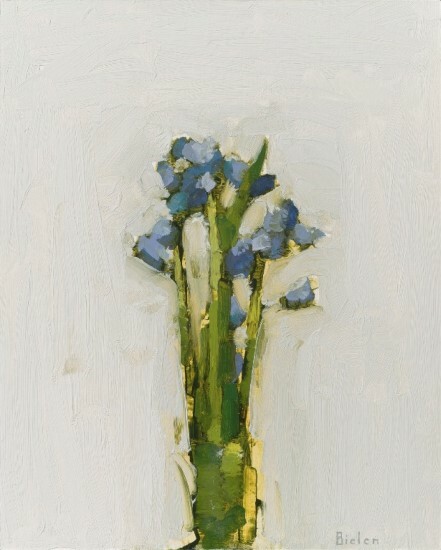 Instead, he translates simple floral groupings into an arrangement of brushstrokes.